eDiscovery Insights | An IT Executive Turned California eDiscovery & Litigation Attorney and Consultant Shares his Personal Insights. As many of you know, I Chaired the move of the former Sections of the State Bar of California to our new entity, the California Lawyers Association. Speaking of busy, I’m proud to announce that the Law Practice Management and Technology Section presented me with the Lifetime Achievement Award. This actually took place on September 14, 2018, but I’ve been bu…you get the idea. 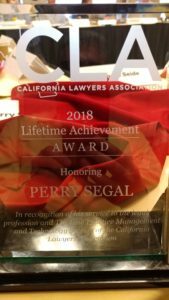 What makes this award so sweet is that I have been with LPMT for nine years, and am just coming up on my eleventh anniversary of becoming an attorney. I guess what they’re saying is, I’ve lived a lifetime during the past decade! 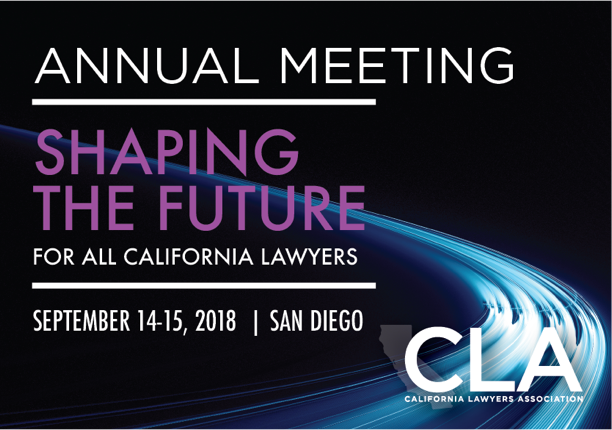 1st Annual California Lawyers Association Meeting – September 14-15, 2018 in San Diego! 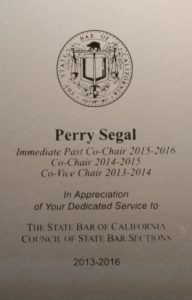 OK – get out your playbooks: Last year, The Sections were still part of the State Bar of California, but our annual meeting was separate from the Bar and was called the “1st Annual Calbar Section Convention“. 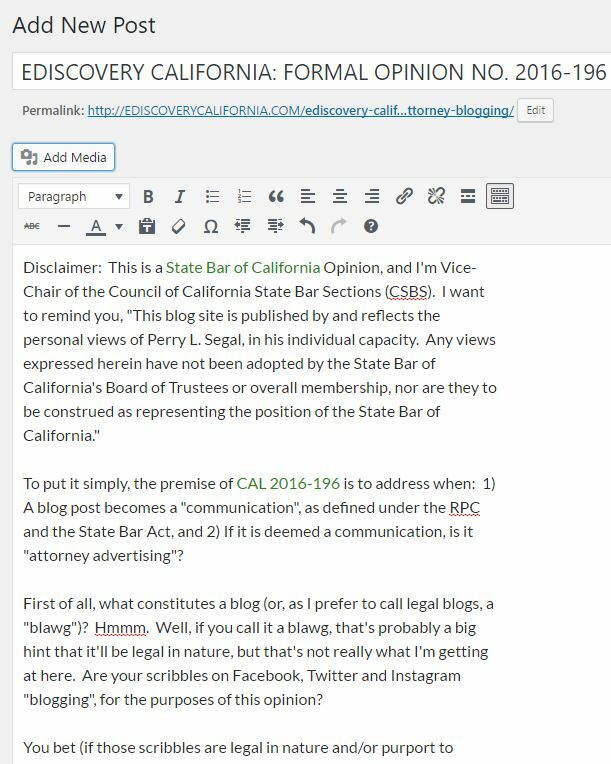 On January 1st, 2018, the Sections were spun off into our own entity, the California Lawyers Association (CLA) – and with a new entity comes a new event name: The “California Lawyers Association Annual Meeting”. Got all that? Keep an eye on the CLA’s page for the event for further details. Mark your calendars. 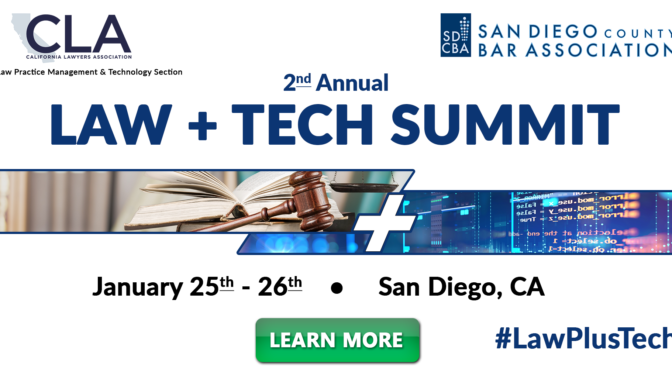 As one of the first out of the gate for the new California Lawyers Association, the Law Practice Management and Technology Section, in partnership with the San Diego County Bar Association, presents the inaugural 2018 Law + Technology Summit, in (where else?) San Diego. Yours truly will be doing a program on Ethical Considerations for your Online Presence. Click here for more details! So, why am I never writing blog posts anymore? 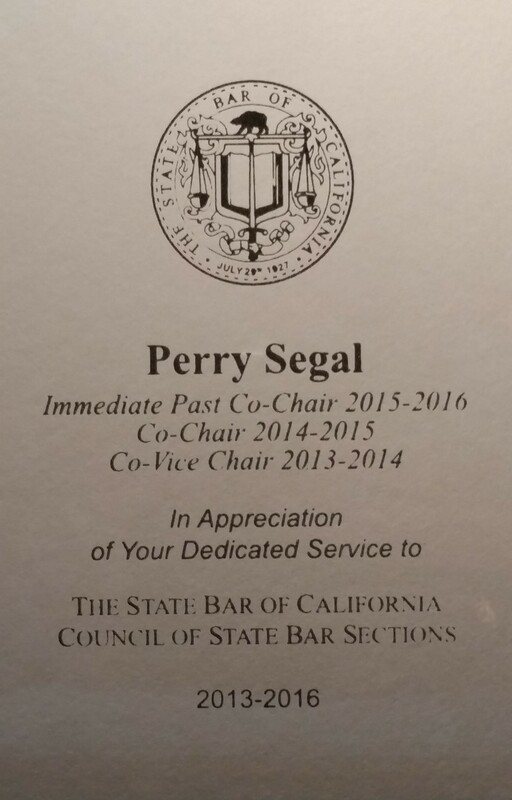 Because for the last two-plus years, I’ve been working to complete the transition of the The Sections from the State Bar of California into a private entity – the last four months as Chair. As of January 1, 2018, the California Lawyers Association became our official home. Visit us at our new site, cla.legal. 1st Annual Calbar Section Convention – August 18-19, 2017 in San Diego! Now, in the spirit of continuing my new tradition, I’m posting the information and links verbatim. The Sections of The State Bar of California are pleased to announce plans for the inaugural Section Convention on August 18 and 19, 2017 in San Diego. Thirty-six education programs, all approved for MCLE credit. Hundreds of California lawyers, judicial officers and legal staff in attendance. Much more is planned, so save the date. Details will be published at Section Convention soon! On the heels of being awarded a tombstone for completing my three-year term on the Council, I was re-elected to a second term. This is unprecedented (probably because prior officers had the good sense not to run again!). My co-officer, Mark Ressa, was also re-elected. The unanimous view from our colleagues: Gluttons for punishment. With no fee bill or resolution to the issue of de-unification/separation, these are extremely challenging times for the Sections. It’s anybody’s guess how we’ll be structured a year from now. 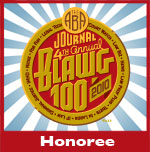 We’re over ten weeks out from the State Bar of California’s 89th Annual Meeting in San Diego. Bookmark this link to stay up-to-date about hotels, registration, events and programs. This advanced program covers all aspects of what attorneys need to know before they place their trust and information—and that of their clients—on the cloud. Learn about the perks and pitfalls of making use of this now-ubiquitous tool, including what State Bar ethics rules have to say. Download LPMT’s free app for Apple and Android devices. All of the programs will be listed on the calendar. Would you believe I just saw for the first time that Legaltech is early this year? Yep, it’s June 13-14 at the Embarcadero Center Hyatt Regency. Follow the link for the latest info and to download a copy of the event catalog.